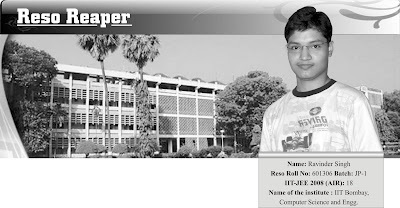 Name of the institute : IIT Bombay, Computer Science and Engg. Q. What is Your Inspiration for IIT? Ans. Both my elder sisters are medical students, they inspired me a lot during my preparation for JEE. I was motivated by their achievements and method of preparation and decided my aim accordingly. Q. How did you manage all the three subjects and your division of study hours for all subjects? Q. Did you solve all the DPPs given to you in classes at Resonance? How did it help you? Ans. I tried to solve as many DPP’s as I could. It helped me a lot as it cleared my basic concepts and brushed up my knowledge every day, helping in my revision also. Q. Did you go for extra material for study? If yes then name the books. Ans. I read Physics Galaxy and University Physics (UP is very good for theory but not for practice) . In chemistry, Morrison Boyd and J D Lee was very useful. I was depending on class notes completely and practice problems in maths. You may find S L Loney, Hall & Knight to be very useful. Q. How did you make a balance between studies at Resonance & school studies? Ans. I completely separated my school life and the time after school. I even used to sleep during the time I got between the two. While I am in school I would listen to the teachers attentively. However I would not worry much about school studies. Q. While preparing for IIT-JEE, what was your favorite hobby to refresh your self? Ans. I used to listen to FM and watch movie whenever I felt I was tired and needed some kind of refreshment. Q. What were your best prepared topics in Physics, Chemistry & Maths? Ans. Physics : Mechanics. Initially it used to be my weak point and I lost a lot of marks in it. But during my preparation for Physics Olympiad I understood many basic concepts which helped me to apply my mind in a systematized way. Chemistry: Organic chemistry Maths: Calculus, P&C, coordinate geometry. Q. Share some tips to increase one’s productivity? Ans. I think the best way is to give your mind and body adequate rest. There is no point in continuing studies when you think you are not able to give your best. While studying, try not to think about anything else and concentrate fully on the subject. One very important thing is to remain cheerful. Two years is a very long duration. You will not be able to cope up with the preparation if you keep on worrying about your marks or rank. Just give your best while preparing for the tests or exams and then do not worry about the result. This is true not just for JEE but also for other situations. Q. How did you plan the final revision of whole syllabus of IIT-JEE in last few days? Ans. Out of 13 available days I reserved 11 days for complete revision. Each day I used to study all three subjects according to the requirements. In chemistry, special emphasis was on inorganic chemistry. On 12th day, I practiced some test papers and on the last day I tried to calm myself. Q. Tell us important topics according to you to revise at final countdown to IIT-JEE? Ans. Physics: Waves, Thermodynamics and Modern physics are formula based and highly scoring. Be sure that you remember all the formulae. Chemistry: Inorganic, as it has to be remembered well. Maths: Revise formulae. Q. 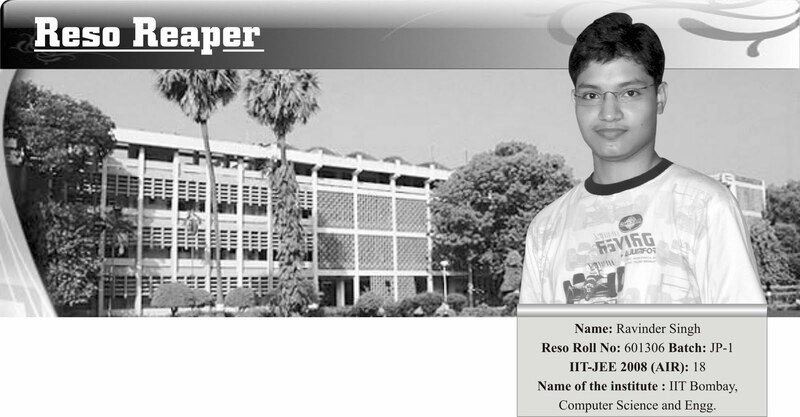 1 night before IIT – JEE? Ans. Just have a good sleep of around 7 hours. Do not worry much as nothing can be done now. Give the exam next day in the best way you can. Q. Tell us about people behind your success? Ans. My family (who was beside me when I had fever on the day of the exam between the two papers), coaching and school teachers, who prepared me well for the final test, God and also a bit of myself. Q. Give some advice to your successors at Resonance? Ans. Have faith in your teachers as they are very much experienced. It is the quality that matters not quantity. This is true for study time, tests as well as study material. “Just give your best while preparing for the tests or exams and then do not worry about the result”.